Japan consists of 4 main islands, Hokkaidoo, Honshuu, Shikoku and Kyuushuu. There are 47 administrative districts; 1-To, 1-Doo, 2-Fu, 43-Ken. 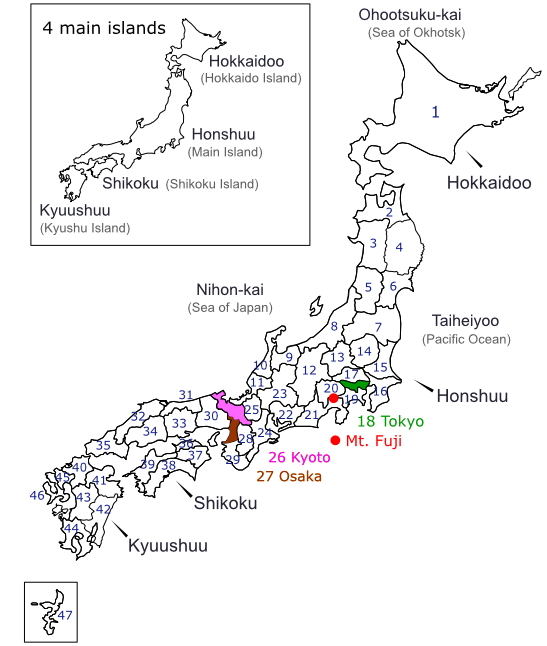 1 To is Tokyo-to, 1 Doo is Hokkaidoo, 2 Fu are Osaka-fu and Kyoto-fu. There are traditional festivals and new festivals in Japan. If you find a dead-link, please let us know. Because, strangely, they often change their URL.